Guest blogger Gordon H keeps his cool amidst plenty of attention. Today’s blog is written by first-year Towering Pines camper Gordon H as part of the TP Journalism Workshop. Gordon also took and edited all the photos for this blog. Gordon, 11, discovered TP through his friend Alex A, a veteran TP camper. Gordon is enjoying camp so far, and “gets along with everyone.” He especially likes the cabin clean-up competition because the winning cabin gets a free trip to Cathy’s Ice Cream Shoppe. He also enjoys doing soap dips in the lake. 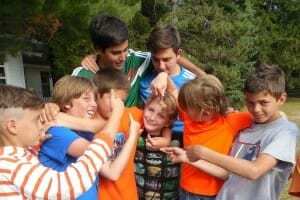 Gordon is famous around camp as “the guy who can solve a Rubik’s Cube” very quickly. His favorite camp food is spaghetti. 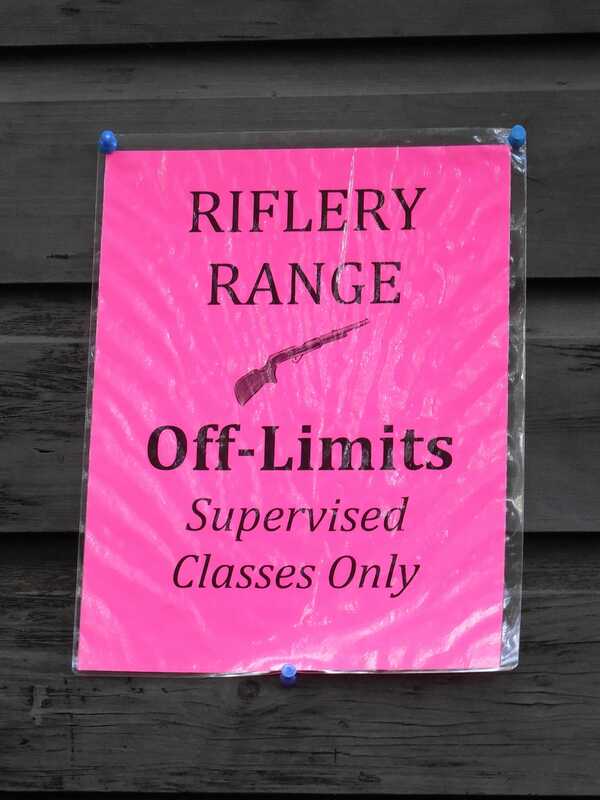 Riflery is one of the most popular activities at Towering Pines. 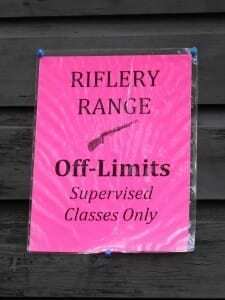 Safety is very important at the rifle range, and we have to follow all the directions. The commands are to keep us safe so that no one is hurt or shot. We have two counselors at the range to give commands and keep us safe. Santi, Santiago, and Ryan teach us to handle the guns safely and shoot better. Safety is top priority at the TP Rifle Range. The rules are: one, you must follow all the commands given by the counselor. Two, you can’t cross-fire at others targets. Three, when it’s not your turn to shoot, you have to sit quietly on the green benches unless you’re a CIT or a Counselor. The rules are easy, but important. Pick up all your brass and put them in the bucket. If you think you shot a qualifier round, tell one of the counselors and he’ll add up your score. 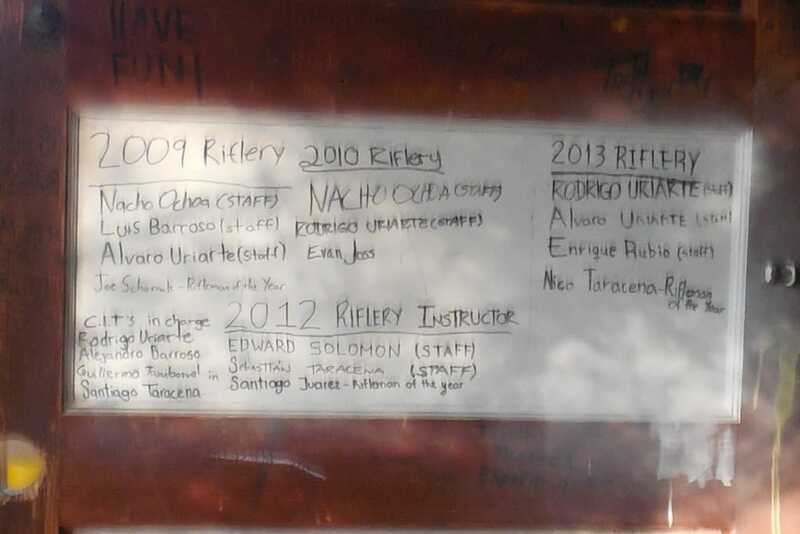 Riflery Door of Fame where Gordon plans to write his name someday. I like that each gun has its own name, like Chucho and El Macho. Younger campers shoot smaller rifles called “chipmunks.” The chipmunks are for campers 9 years old or younger. These rifles are lighter and less powerful than the regular rifles. 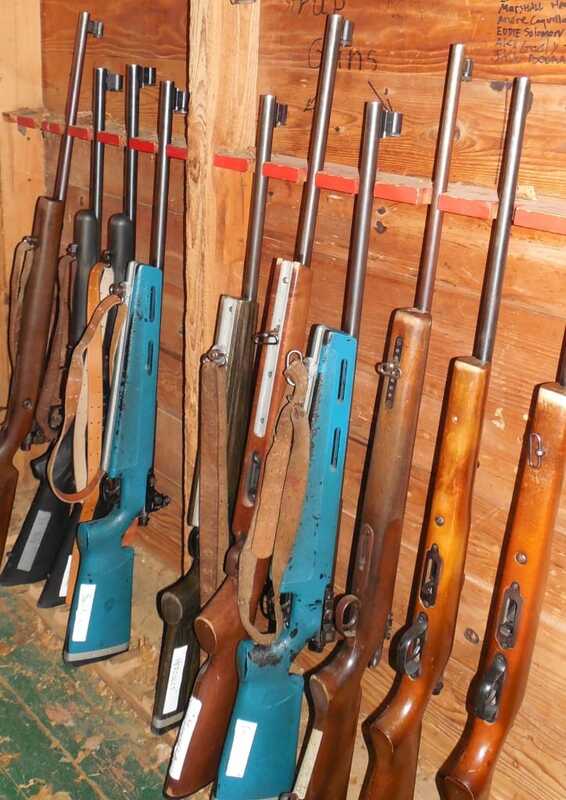 The rifles are locked up when not in use. We shoot two rounds each day, with 5 bullets in each round. The middle circle of the bullseye target is the smallest, and worth 10 points. The next circle is worth 9 points. The biggest circle is only worth 2 points. If we miss the target, we get zero points for that shot. This summer is the first time I’ve learned rifley, and I got my Pro Marksman last week. To pass a rank, you must shoot 10 qualifiers. As we move up ranks, we have to shoot higher scores from different positions. By the end of the summer, I hope to pass as many ranks as possible. Great job with the blog Gordon! Keep up the great work as a journalist, and good luck at the riflery range this summer.